For me, comics are filled with a million "I wish I had thought of that" ideas. Even more so than the movie industry, comics are where new ideas are born. Every year there are at least a handful of comics creators who always manage to astonish me with their ideas, with their absolute and unbridled creativity. The Pirate Eye was not one of those for me. At least the premise wasn't. I remember picking it up off the shelf a few times, but never managed to pull the trigger. I just wasn't interested in pirates. I blame Johnny Depp and the Pirates of the Caribbean movies. Pirate-fatigue was the official diagnosis. In fact, the awesomeness of the title's pun itself was entirely lost on me at first. I just wanted to read my regular comics, not "pirate noir." I'm stubborn at the most inconvenient times in my life. It's a character flaw but I'm trying to work through it. When I first heard the elevator pitch for this book, I think I had the same reaction that a lot of people probably did and do: What? Why? So I never picked it up, even though the art looked great, I was sure the story wasn't something close enough to what I liked, even though I love mysteries. I figured I wouldn't enjoy it based on absolutely no evidence and only my bad attitude. Turns out I was incredibly and fundamentally wrong. This comic is the good stuff, and nothing that you would find at the big two comic companies. Bonus for us all. The book's main character is named Smitty, who after some drama in his past, is outcast from his pirate brethren, resigned to be land-locked, and forced to use all the skills that set him apart as a pirate, including his ability to find treasure or whatever seems to be hidden or missing to help him survive his new home. Turns out he's adept enough to make a passable living for himself as a "finder." I love just how well this situation works, and Smitty makes a great private detective. It's weirdly plausible. I even applaud Grahn's resistance to have his main character have an eyepatch. That would be too on-the-nose. The writing in this book is stellar, and Grahn's ability to script believable dialogue for these pirate characters is immense. He's also artful at writing a mystery that doesn't lose you, but allows you to feel like you should've guessed the solution yourself. One that doesn't make you insane enough to talk to yourself or your book. It happens, don't look at me like that. I can't be the only one. So it turns out this book is exactly what I needed then, but passed it up. I've only just got around to giving in to all of my fellow comic nerds who have been suggesting it to me. I'm not sure what, aside format he pirate setting, put me off. The artwork is great. Yonder can certainly illustrate an interesting pirate tale. This work is all you need to see to prove that point. His style is not hyper-detailed or full of crosshatching nonsense, but more akin to what a Michael Lark or Sean Phillips would be putting down on the page. Dark and beautiful. The layouts are nice also, and make it a breeze to follow the action, while keeping the dialogue heavy panels interesting, and far from dull. Also, aside from being the perfect artist for this title, Yonder has the ability to color his own pencils and inks in such a way that it really adds to the atmosphere and takes it to another level on more than one occasion with the moody atmosphere. My only complaint is that all the characters surrounding Smitty seem to be a little one-dimensional. Some tend to come off as lacking any real depth of character, seemingly having no backstory or motivations of their own. This could be intentional, and meant to lend a feeling of pulp fiction or a old film and radio serial's vibe, back when there was a more black and white sense of good and evil, but I'm not convinced from the stories we're told in this volume. There also seems to be no lasting effects on Smitty, or nothing that sticks with him from one one-shot to the next. I understand why that might be the case too, but I like at least a little character development in my stories. That being said, these are not anywhere near big enough complaints to warrant anyone to stay away. The exact opposite is true. More people need to read this book. You need to read this book. 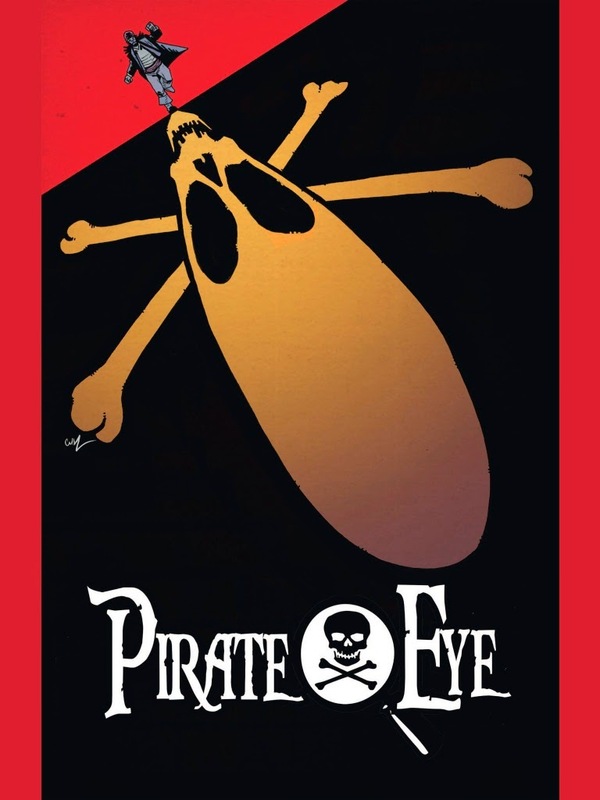 This is not the pirate epic in Tales from the Black Freighter sections of Watchmen you want to skip over every time you reread that book, it's fully worth your time. And where else are you going to get to read the adventures of a pirate gumshoe? That's what comics can do. This book really glows and I'm kinda slow for passing it up for this long. My only defense is that there are a lot of great comics out there and I can't seem to read everything no matter how bad I want to or how hard I try. Things fall between the cracks. But, if I had it all to do over, I'd have snatched this up and put it at the top of my to-read list. At the very least it deserves to be in your to-be-read pile. I'm sure you won't be disappointed.